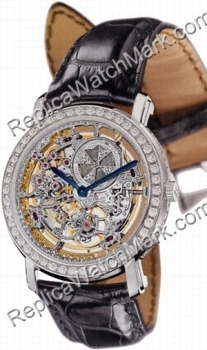 Beautifully Crafted Skeleton Watch. Front & Back are of Sapphire Crystal with Blued Metal Hands. All parts are beautifully hand engraved & finished to perfection. Bezel, Case Edges & Buckle set with 98 VS1 Top Wesselton Quality Round Diamonds - weighing a total of 1.61 carats. Aprox. 43 hour power reserve.